by Linda Hickam. Thanks, Linda! It's food. It's history. It's a tribute to the community. 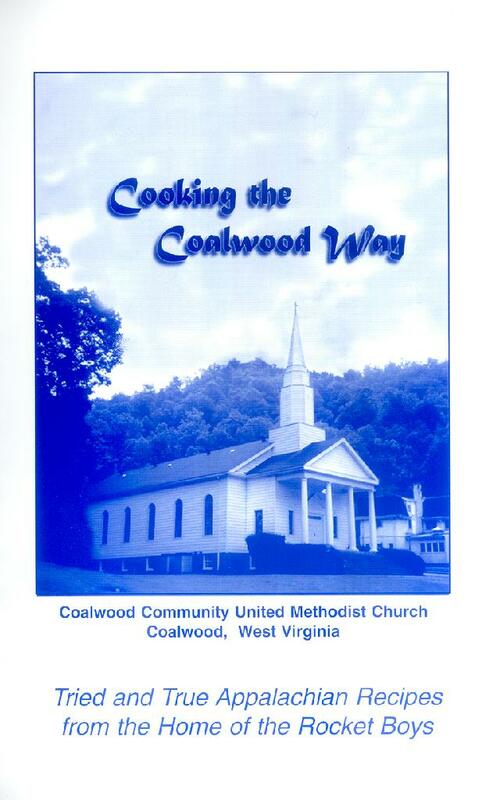 A compilation of recipes titled "Cooking the Coalwood Way," has recently been published by members and friends of the Coalwood Community United Methodist Church and includes recipes handed down for generations through the coal camps as well as other items of both spiritual and historical interest. Opening with a photo of Coalwood Mountain and a poem about cooking the Coalwood way, the book includes a copy of the Coal Miner's Prayer, a forward by Homer Hickam, a table blessing, and sections that include appetizers and beverages, soups and salads, vegetables and side dishes, main dishes, breads and rolls, desserts, cookies and candies. Interspersed with these are such things as Ten Commandments for Living with People, Life's Recipe, and photos of various landmarks in the Coalwood area. The book is now available for sale through the Coalwood United Methodist Church and pays homage to Hickam and the Rocket Boys of Coalwood who were first recognized in the 1999 motion picture, "October Sky." The book contains favorite recipes submitted by Hickam's mother, his wife, the Rocket Boys and the residents and friends of this McDowell County community. While growing up in Coalwood, Hickam and his family attended the Coalwood United Methodist Church and the cookbook's title reflects the name of one of his books, "The Coalwood Way." Hickam's memoirs often reflect his love of home cooking as he recalls the trials and tribulations of this coal mining community. In the Coalwood memoirs, which includes "Rocket Boys," "October Sky," "The Coalwood Way" and "Sky of Stone," he often speaks of his church and frequently recants stories of riding his bike down the road a piece to the Mudhole Church (Mt. Zion United Methodist Church) to gain knowledge from the biblical teachings of the Rev. Little Richard. Recipes range from Big Creek Cheese Spread, Wilted Lettuce and Fried Green Tomatoes to Bill Bolt's Favorite Chilly Day Chili, Rocket Boys Banana Pudding and October Sky Pumpkin Pie. Norma's Mountain Mush, Company Corn Bread and Mountaineer Squirrel Stew. In fact, the book even includes a recipe for the Sterling Drive Inn Submarine which is famous throughout the area for those who eat at the diner in Welch. Included here are a few of the recipes featured in the cookbook. Rub Pepperidge Farm buns with cooking oil or margarine and place in 300 degree oven to warm. (Another recipe calls for: gentle deep frying of buns in hot oil, but it is difficult to keep buns from becoming grease-soaked). Cut buns open lengthwise. Mix meat with mayonnaise, salt and pepper to taste. Spread scoops of meat mixture onto baked warm bun. Top with bacon, slices of cranberry sauce, tomato and lettuce. Serve with chips and a soft drink. Preheat oven to 450 degrees. Mix all ingredients together except oil. Put1/2 oil in 9 by 9 baking pan and the rest of oil in with other ingredients. Bake 15 to 20 minutes. Bring water and salt to a boil in a large Dutch oven, stir in macaroni. Return to boil, cooking for eight to 10 minutes or until tender. Drain. Rinse with cold water, drain. Combine macaroni, cheese, sour cream, mayonnaise and pimento. Spoon into greased baking dish and sprinkle with crushed crackers. Bake at 325 degrees for 30 to 35 minutes.